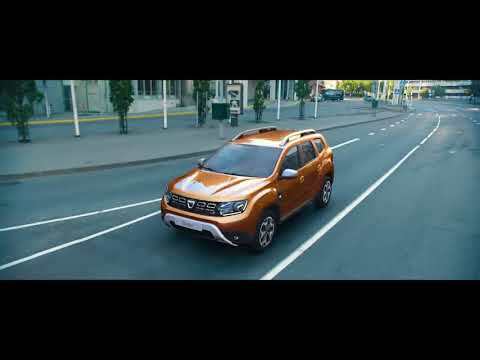 ✔ Satin chrome roof bars with "Duster inscription"
The stylish Dacia Duster is more than ready for fun filled adventures! With advanced technology and a host of safety features, never seen before in the Dacia range, the second-generation Duster certainly lives up to Dacia’s title of ‘Best Value Brand AutoTrader 2018’. With sculpted body panelling and front and rear LED daytime lighting, the Duster’s front end enjoys a fresh and assertive look. Featuring a high belt line and a grille extending to the headlights, the Duster boasts a wide and robust appearance whilst simultaneously maintaining its compact size. Inside the cabin, both space and comfort are generous with up to 445 litres of boot space and comfortable seating. This spacious interior can comfortably fit 5 adults and luggage: perfect for family trips! Additional enhancements make for a truly pleasurable drive including climate control, automatic headlight activation, and keyless entry available with the Prestige trim. Electric power steering has also been introduced, making parking considerably easier. It’s equipped with an array of modern safety features and technology to guarantee driver safety as well as peace of mind, including a dashboard MediaNav 7” touchscreen with SatNav, multi-view camera, Blind Spot Warning and Hill Start Assist. To ensure maximum safety, the Duster has been externally reinforced with a robust frame. The Duster’s high ground clearance, 17-inch wheels, large skid plates and real-time compass ensure optimum off-road performance. Available as either a two-wheel drive or 4x4, the Duster is a highly versatile SUV made for everyday use or more challenging, rugged terrain! The Dacia Duster is available in four trim levels to suit your needs: Access, Essential, Comfort and Prestige. Choose between a petrol and diesel engine. These are the SCe 115 (2WD and 4WD versions) and the Blue dCi (2WD) – both versions come with a manual gearbox.